drupa: Impressed by great success! For 11 days, the 260,000 visitors to the largest specialist trade fair for the print industry were able to see for themselves how important humidification is to the industry. 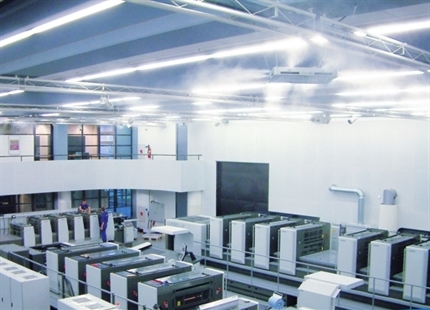 In a space measuring 16,000 m2 in the exhibition halls of Heidelberger Druckmaschinen AG and HP Inc., DRAABE showed how precisely, hygienically and reliably DRAABE high-pressure humidifiers guarantee optimum climatic conditions for the printing process. Over 50 direct humidifiers, together with the installed water treatment system and high-pressure pulsation, formed the largest temporary humidification system in Europe. Under the slogan ‘Simply Relax’, DRAABE also presented itself as a Heidelberg Partner in Hall 1 with a very special exhibition stand: surrounded by a “birch forest”, tired exhibition visitors could take a break from the hustle and bustle of the exhibition and enjoy the revitalising freshness of the air humidity. In keeping with the slogan, DRAABE presented its new DuoPur system: with the new complete system, the humidification specialist is making it even easier for printers to solve problems such as electrostatic charging and paper distortion in the future – with reduced effort and costs, and without having to take care of the necessary maintenance work. Even for HP, the largest exhibitor at drupa 2016, the DRAABE slogan was brought to life and turned into an experience. “In the truest sense of the phrase, my team and I were very relaxed on all of the drupa days thanks to the air humidity that was perfectly balanced for our machine demonstrations. With regard to performance and service, DRAABE is the best humidification solution that we could wish for,” summarises Rotem Sagi Shteinmetz, Operations Manager in the HP drupa team, when speaking of the collaboration with DRAABE. There was also plenty of reason to be pleased at the DRAABE stand in Hall 16: “We are extremely satisfied with the number and, above all, the quality of the conversations we held. The positive investment climate exceeds our expectations and has increased significantly compared with 2012. Quality, sustainability and service were the subjects that most interested our exhibition visitors. Even now, it looks like we’re experiencing the biggest volume of enquiries that our company has ever been able to achieve at a drupa event,” says Jens Kunde, DRAABE Executive Board, delighted. DRAABE was the only drupa exhibitor who is permitted to certify air humidification systems according to the latest VDI 6022 Sheet 6. "Simply Relax" was the slogan at drupa 2016 in hall 1 of Heidelberger Druckmaschinen AG. DRAABE exhibition stand - only exhibitor with certificated humidification systems to VDI 6022 Sheet 6.